To protect your home or business with a professional wireless security system we have bring to you LifeSOS. 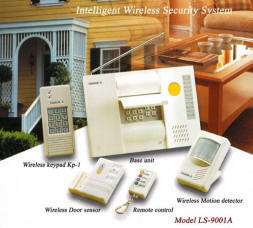 A wireless alarm system LS-9001A. With this system you can even install in your home and office after the renovation as all the accessories are fully wireless thus no cables are required in the installation. This system also come with intelligent features against break-ins, burglaries and fires. Additionally the panic and medical help buttons can summon assistance or call for police in the event of attack, medical problem or even in a holdup or hostage situation. For the medical application it is very useful for elderly and people with medical condition that need help. Each sensor in the LS-9001A system has a built-in radio transmitter, no hard wiring is required and installation can be completed very quickly and Do-it-yourself. LS-9001A dials out the preset telephone numbers automatically when the system is activated. It than advice the called party of the alarm type and caller's address to summon help. The system will redial the number automatically in case of line busy, no answer, answering machine or even if a child answers the phone. Up to nine telephone or pager numbers can be preset. Four of them are separately assigned to special numbers like police station, fire brigade and hospital for different alarm events. After the connection of an emergency call, the called party can listen in or talk with the people near the base unit directly so as to take proper measures quickly. Furthermore you can use LS-9001A as a speaker phone for hands free phone calls. You can dial in from a touch tone telephone anywhere in the world to arm and disarm the system. At the same time listen in or to check the alarm record. Wireless Door, Glass break detector and PIR sensors are always supervised by the system. In case you arm the system while a door or window is still open, LS-9001A will emit a warning sound to remind you. In addition, the door sensors and PIR sensors report to the system by sending "Check-in" signal regularly. If any of these sensors are deactivated or removed, a warning indicator will advise you. Smart code with multi-million combinations. LS-9001A provides over 4.7 million codes for radio transmitter. By using the "smart code learning" technology, only learned transmitters can be incorporated into the system, this keeps the system safe and free from interference. Multi-zone with selectable partial arm features. There are 9 burglar zones and 2 fire zones in the system. You can arm selected zones when you are home, leaving you free to move about in safety. Sirens and auxiliary relay output. Either wired or wireless siren can be used in the LS-9001A. The former can be connected to the auxiliary relay output of the base unit, while the latter operates separately from the base unit and protects the location of the base unit from an intruder. With the internal battery, the LS-9001A can continue operation without interruption during a power failure. Meanwhile, the voice message, telephone numbers and setting data saved in the memory can be retained for months even with no power supply. Remote control and wireless keypad. You may control the LS-9001A remotely either by a four button remote controller or by a wireless keypad. With backlight feature, you can operate the wireless keypad even in the dark. When unauthorized pass code is keyed in continuously, the system will lock, thus preventing anyone from tampering with the system. Owing to battery operation, it makes installation very easy and flexible. Meanwhile, low battery detection is a built-in feature. The Medical help button transmitter is designed to be worn on the wrist or on the neck. By pressing the button, you can trigger the alarm and summon help immediately. The button is waterproof, extending the areas of use around the house. A wireless PIR motion detector can be set as the monitoring device of the inactivity zone. If it does not sense activity over a designated period of time (1 to 72 hours programmable), LS-9001A will automatically summon help. For the old people who are home alone, this function can provide them with more secure life. A complete range of accessories are supplied in LS-9001A system, you may choose the according to your requirement of real condition and expand the system easily whenever you need to. Thanks to the built-in digital communicator, LS-9001A can be link up to a central monitoring station through a PSTN line when it is activated. Frequent Ask Question about the LS-9001A. To answer all your question about the LS-9001A wireless system, we have created a FAQ page for you. Please "Click here" to get all your answer. Base unit Power adapter: 12VDC/300mA. Frequency: 315.0 Mhz or 433.9 Mhz. RF range: 200 fts @ open field and ambient temperature 25degree C. Resonator: SAW (Surface Acoustic Wave) device. RF transmission code: 4.78 millions combination. Dialing mode: Pulse or Tone selectable. Preset telephone: 9 numbers with Max 32 digits for each number. Voice recording: Total 29 seconds, 5 Segments. Entry/Exit delay: 0 to 255 seconds. PIR Motion Detector Detector type: Dual elements. Coverage angle: 110 degree. Effective distance: Max 12m @ ambient temperature 25 degree C. Power: 9VDC battery. Current: 3 micro amp @standby and 7mA @ operation. Pulse count: 2 or 3 pulses selectable. Glass break detector Type: Piezo detector. Range: 3m radius. Power: 9VDC battery. Current: 10micro amp @ standby and 8mA @ operation. Smoke detector Type: Photo-electric. Power: 9VDC battery. Current: 4micro amp @ standby and 8mA @ operation. Siren Alarm time: 0 to 255 seconds programmable. Sound level: Over 110dB. The above accessories can be purchase separately and incorporated in to the base unit LS-9001A system. All connection and installation is fully Do-it yourself. Other Information: The above wireless security alarm system Model LS-9001A is an IDA approved system as such is APPROVED to be used in Singapore. The other approval obtained are CE. ETS. BZT. PTT. and FCC approved. To purchase the above equipment please call or e-mail to sales@secureciti.com, or contact Securitex Electronic Systems Engineering. Our sales personnel will get back to you. @1997 to 2018 All right reserved.